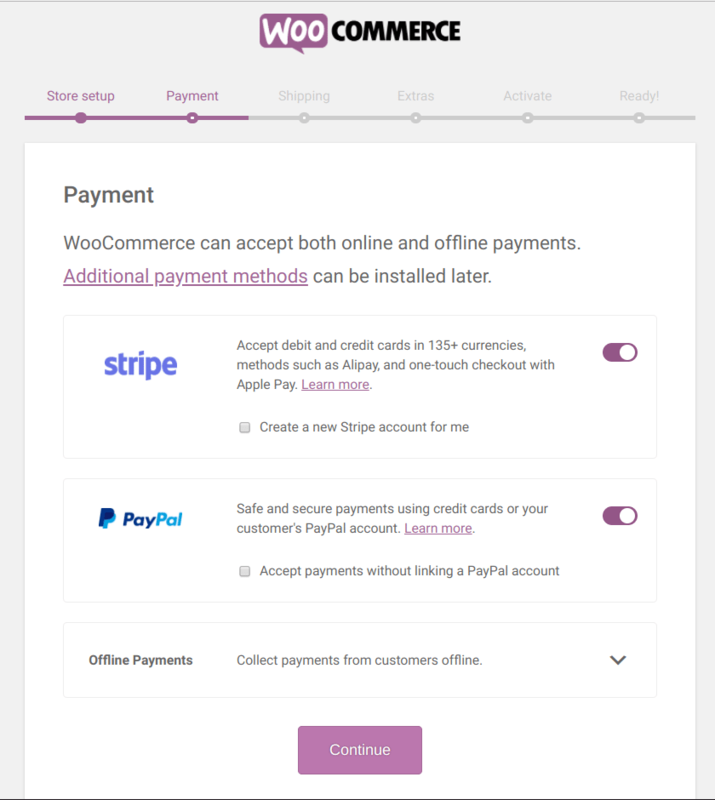 Setting up WooCommerce on a WordPress site starts with downloading, installing, and activating the WooCommerce plugin in your WordPress dashboard. This quick-start guide walks you through those steps, plus shows you how to set up payments, shipping, tax settings, and start adding products to sell. Before you can start setting up WooCommerce, you need to have a WordPress site. If you don’t have one yet, you can set one up in minutes with our recommended WordPress hosting provider, Bluehost. Once WooCommerce is installed (takes just seconds), click Activate to make WooCommerce active in your WordPress dashboard. Now WooCommerce is installed and active within your WordPress dashboard and you’re ready to start setting up WooCommerce, which takes just a few minutes. 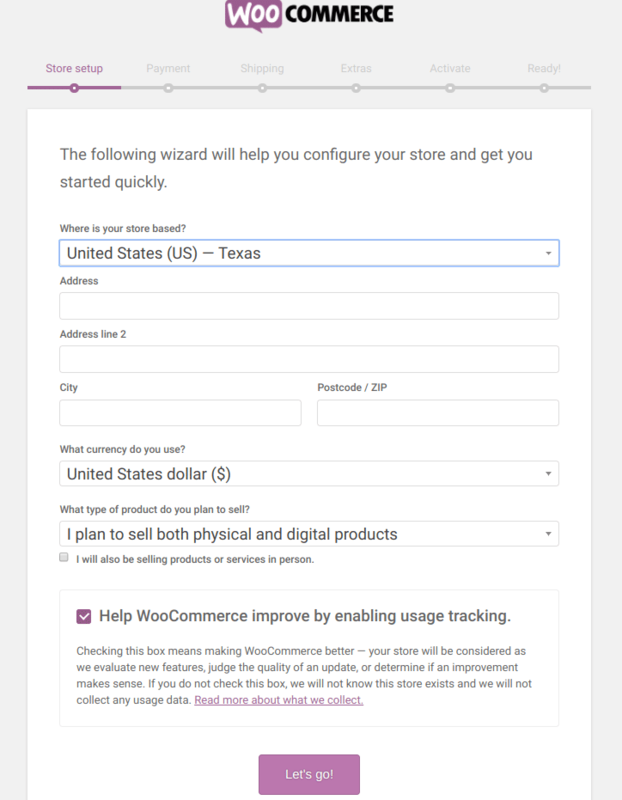 When you click Activate, the WooCommerce Setup Wizard pops up. This is the quickest and easiest way to set up WooCommerce. You can skip this and set up WooCommerce manually if you wish, but that takes longer, especially if you’re new to the platform. Your next screen is your Payments setup. 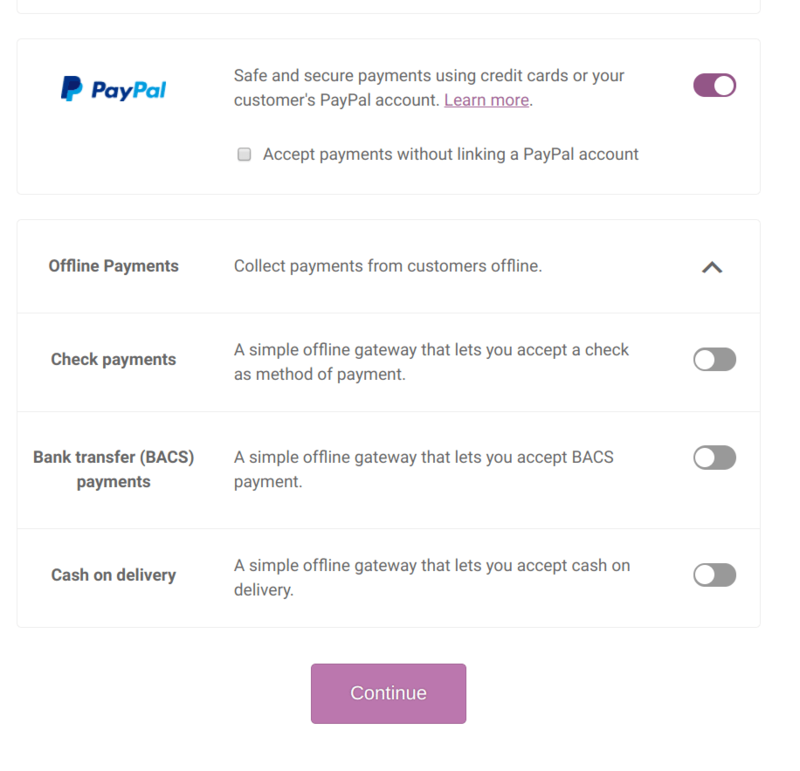 If you don’t already have a way to accept credit cards, WooCommerce makes it easy to get started with two top-rated online payment services, Stripe and PayPal, by clicking the appropriate box or boxes (yes, you can use both) on this screen. Note: You’re not committed to any selections you make in the Wizard. 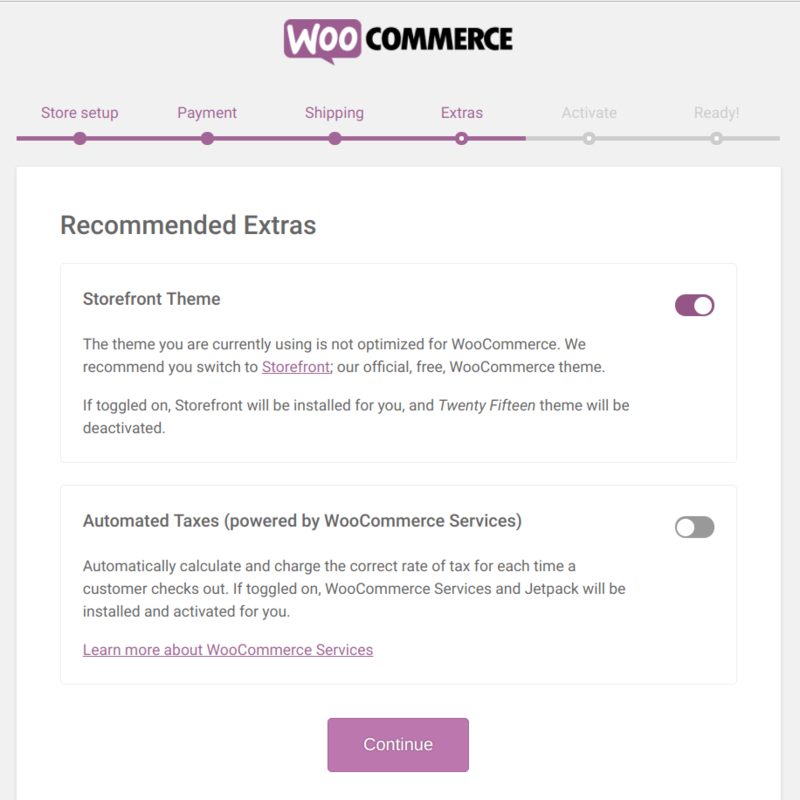 You can always modify choices in your WooCommerce settings, which we’ll cover in detail later in this guide. After completing the Payments screen, click Continue, which takes you to the Shipping setup screen. 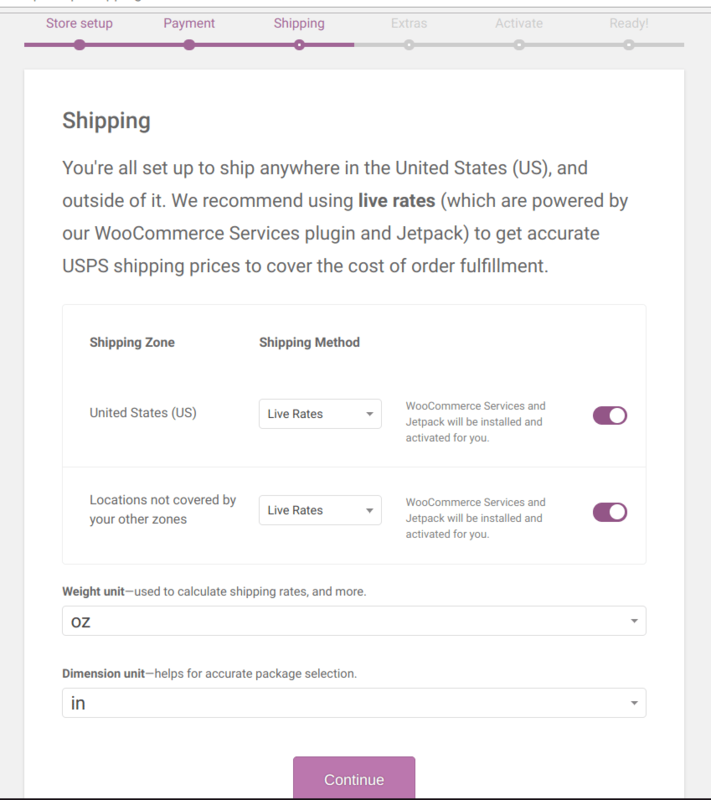 If you’re based in the U.S. or Canada, WooCommerce gives you a handy Live Rates option that connects your store to USPS or Canada Post. 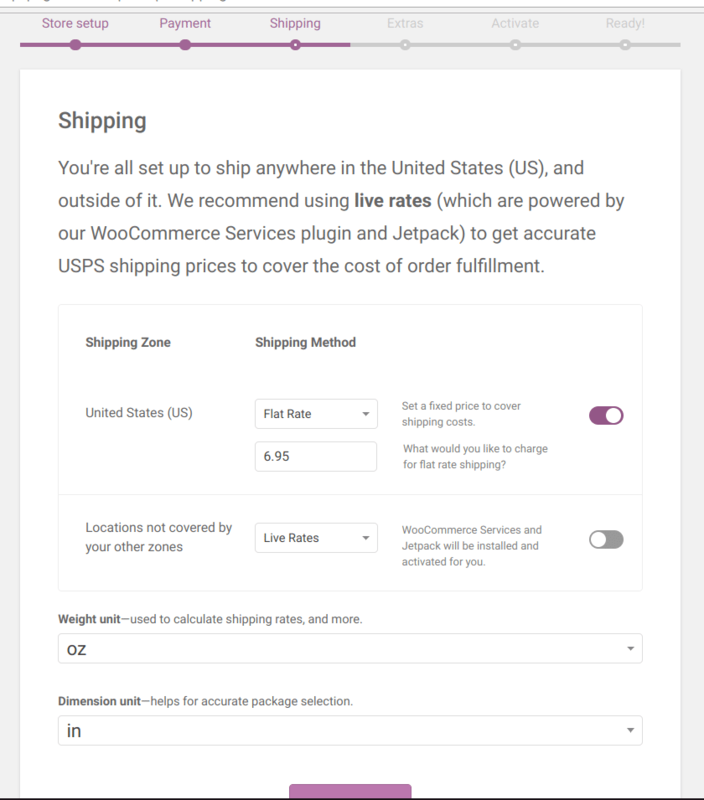 This lets you charge actual shipping rates plus print shipping labels from your WooCommerce dashboard. The correct weight and dimension settings matter if you use Live Rates, so be sure to select those on this screen. If you don’t want to use Live Rates, you can also select Flat Rates and enter a flat-rate shipping charge to be applied to all orders. You can also select Free Shipping to have no shipping charges added to orders. Underneath your main Shipping Zone (for us, it’s the U.S.), you have an on/off option for locations not covered by your other zones. If you don’t want to accept international orders yet, leave this turned off. Of course, you can change your shipping zones or rates anytime, so you’re not committed to what you select in the quick-start. Click Continue to save your Shipping settings. The next screen deals with your store’s design Theme and Sales Tax Settings. 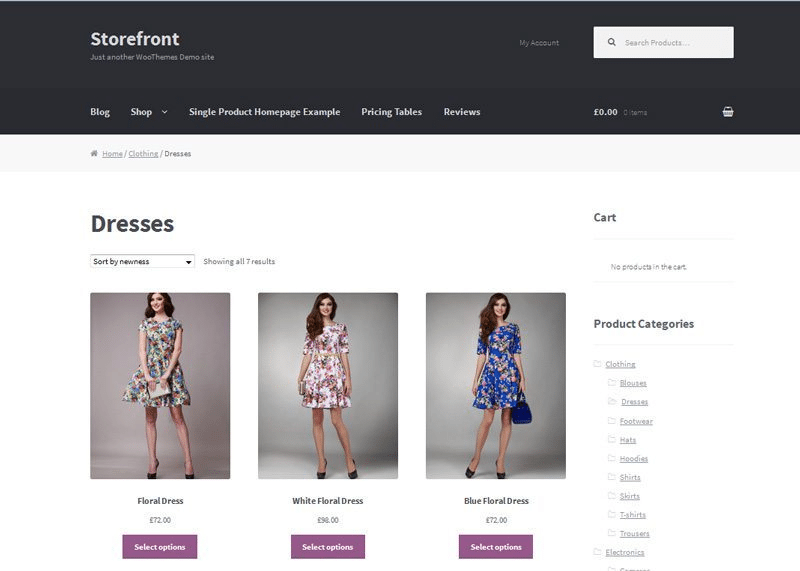 You can always start with the free Storefront theme now and change your design to a different theme anytime you wish. That’s easy to do in WordPress, and you can find a huge collection of low-cost WooCommerce-ready themes on ThemeForest and MyThemeShop, or try Divi by Elegant Themes. Jetpack will have you connect your store to Jetpack services via WordPress.com If you don’t have a WordPress.com sign in, it will prompt you to create one. 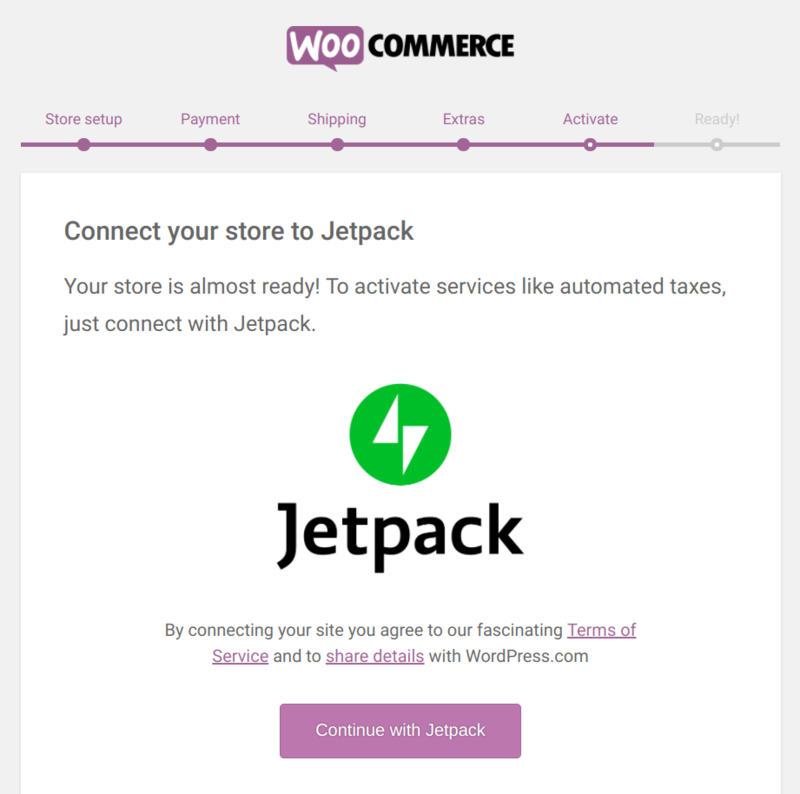 Then it will automatically connect your WooCommerce store to Jetpack. This takes just a minute to complete. After that, your final screen prompts you to Create a Product or Import Products into your new WooCommerce store. You can click on either option and continue. You can also exit the wizard and return to your WordPress dashboard. We’ll continue with adding products to your WooCommerce store because that’s really the main point of learning how to sell on WooCommerce. After setting up WooCommerce quick-start, you’ll find two new tabs in the left menu of your WordPress dashboard. These are WooCommerce and Products. To start entering products, click on the Products tab to open the products menu. From this menu, you can review and add products in WooCommerce, control product-related settings, and create categories to organize your product listings. 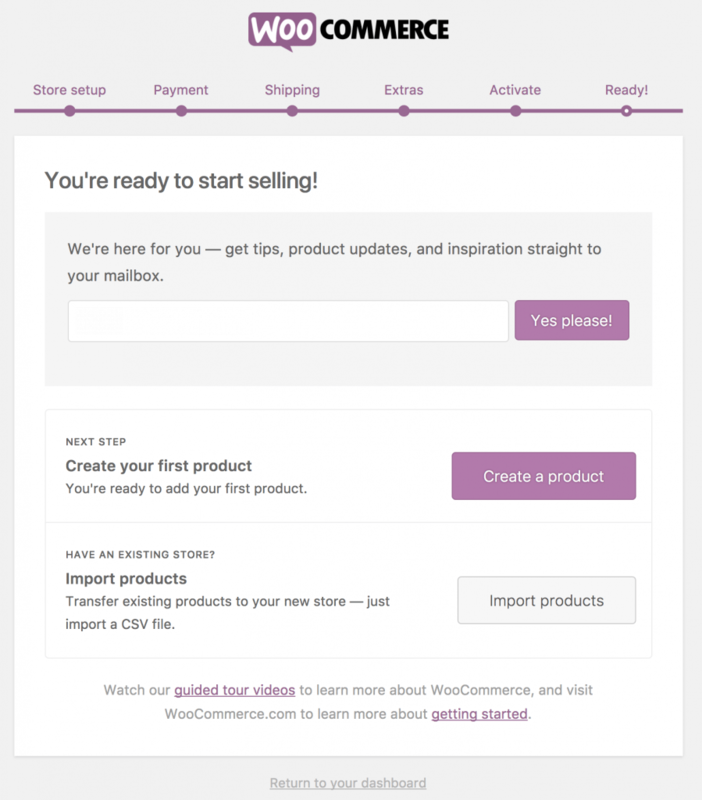 To learn more about organizing and creating products, visit WooCommerce’s in-depth product tutorial. For now, we’ll run through the steps to add a new product. Click on Add New to open the WooCommerce Add New Product screen. At the top, you can enter your product name, which becomes the title of the product page, then add your sales description in the large text box. After that’s complete, scroll down the page to find the Product Data section. First, you want to select the type of item you’re selling. WooCommerce lets you sell digital goods via download, virtual items like services, and a wide variety of physical products that ship. After selecting your product type, you can move down the box navigation to enter your pricing, item SKU or product number, inventory counts, and other details like size or color attributes and product category. WooCommerce product entry tutorials explain all of these options in detail. Before saving the page, head to the right side of the Add a Product screen. Here you can upload your main Product Image and add additional descriptive photos in the Product Gallery. Once complete, on the right side of the screen you can save the item as an unpublished Draft, or click the blue Publish button to save and instantly make it live on your WordPress site. You can also check your work at any time by clicking the Preview button. It’s a good idea to save the page in Draft form every few minutes so you don’t lose your work. For more information on entering products and learning how to sell on WooCommerce, visit the knowledge base to explore tutorials that cover every feature in detail. With your quick-start steps complete and products entered and published, you are nearly ready to sell. However, if you skipped any of the quick-start steps, you need to finish setting up WooCommerce before you open for business. You also need to add a few pages to your WordPress site to convey key information to your customers. After your WooCommerce settings are complete, head to the Pages section of your WordPress site and click on Add New to create unique About Us, Customer Service, Shipping, and Privacy pages, or other informational pages. These pages help you clearly convey your shipping methods, business hours, return and privacy policies, and contact information to your shoppers. If you’re new to WordPress, there’s still more to learn about managing pages, creating menu navigation, and setting up your design theme, but we have you covered. Our WordPress Template Guide covers these basics and more. Once you complete the WordPress side of the equation, you’re ready to launch your WooCommerce store. As your sales grow, our order fulfillment guide helps you find ways to efficiently manage your day-to-day shipping tasks. Or, if you want to hand these time-consuming order packing and shipment tasks off to the pros, be sure to check out our comparison of top-rated fulfillment companies. Setting up WooCommerce on a WordPress site is quick and easy. With just a few clicks, you can install and activate the WooCommerce shopping cart plugin into any WordPress site. From there, the WooCommerce Setup Wizard walks you through every essential step you need to sell on WooCommerce. If you don’t yet have a WordPress site, visit our guide on How to Make a WordPress Website. It walks you through a simple, three-step setup with our recommended hosting provider, Bluehost. Since WooCommerce is a free plugin, and WordPress sites on Bluehost cost just a few dollars per month to run, there’s no reason not to give e-commerce a try. Are you thinking of opening up a WooCommerce store or move an existing store to WooCommerce from another platform? We’d love to know how it all goes in the comments below.